Carpenters Colchester - A G Carpentry Ltd. Improvements to the home, new doors, skirtings, architraves, build in wardrobes, shelving. 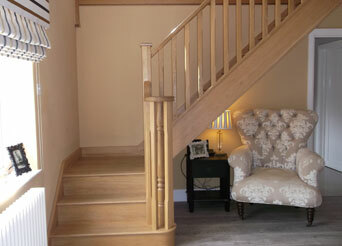 A G Carpentry Ltd of Colchester, Essex is a well established company that only employs highly qualified carpenters. We are experts in all aspects of traditional and modern construction, including traditional and truss roofing. We take pride in making sure all our work is finished to the highest standard. All images featured in our site are our own work. Please do take a look through our website - numerous references are available on request. Please call us and we will be happy to provide you with a FREE No obligation quotation. We can also arrange any aspect of plumbing, plastering, tilling & flooring.